The sandwich was not just good because we were tired, starving and practically had lost hope on finding a place to eat. It was good because it was filled with individually good foods that seemingly didn’t go together, but somehow worked. I promised way back then that I would try to recreate it. It may have taken awhile, but JC and I finally did. Mind you, this was not exactly that sandwich but it was our homage to the lomito. Nothing truly can ever be the original experience. But according to our guests, ours was delicious. First you have to make the pork. Or you can buy cooked pork from a specialty market. 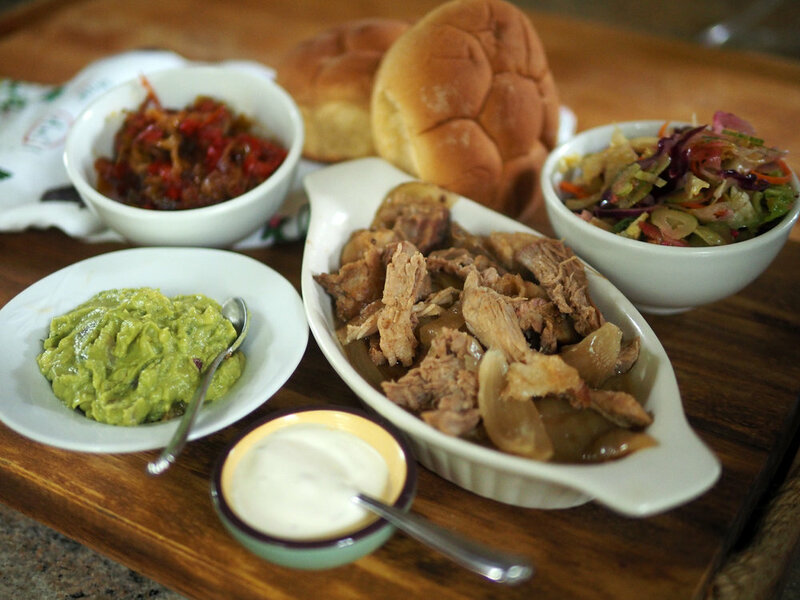 You can go two different avenues - the pulled pork kind or roast pork slices. Here is what we did with JuanCarlos leading the charge on the pork as I captured his messy hands along the way. If you make your own pork, bare in mind that you have to start a day (or 2 depending on what time you need to serve it) ahead of time because once the pork is marinated it needs rest in the fridge for several hours or overnight, plus the cook time of an additional 7 hours. So, this is not one of those “let’s make pork” tonight recipes. The spice rub line up. The pork shoulder. Definitely a piece of meat you can lean on. 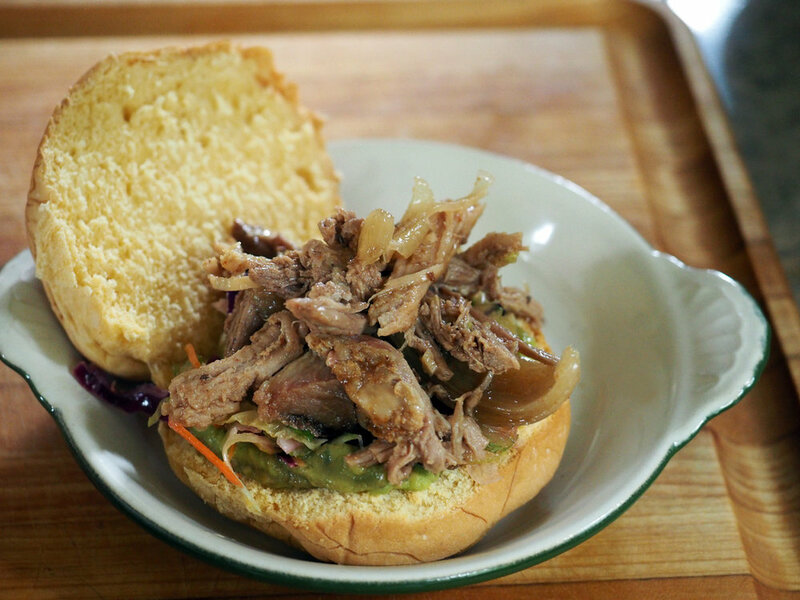 We used Ree Drummond Pork Recipe as a guide, but added a few of our own ingredients. Below were the amounts we used. Follow the linked recipe for cooking. JC made two modifications. He didn’t refrigerate overnight, and he cooked the pork for only 6 hours. This gave us pork slices instead of shreds but I would be careful doing it this way as it is easy to run the risk of the pork not being tender. If you are experienced with cooking pork shoulder, go ahead. If not, I would recommend cooking it according to the Ree’s recipe to get the pull of the pork. Also, we did not use BBQ sauce. We only used the luscious juices that it produced along with the onions. After you have all the ingredients mixed together, lovingly rub the mixture ALL over (front and back) the pork. Then wrap it in plastic wrap and refrigerator for several hours or overnight. Rub-a-dub-dub, Rub it with love. Then place the pork in a large roasting pan on a bed of the onion halves and cook in a 300 degrees F. Roast until fork-tender and falling apart, about 7 hours. Remove the pork from the pot and set it on a cutting board. Slice some of the onion. While you are waiting for the pork to cook, move on to making all the fillings. I decided that instead of the limp string beans, I would make a slaw. 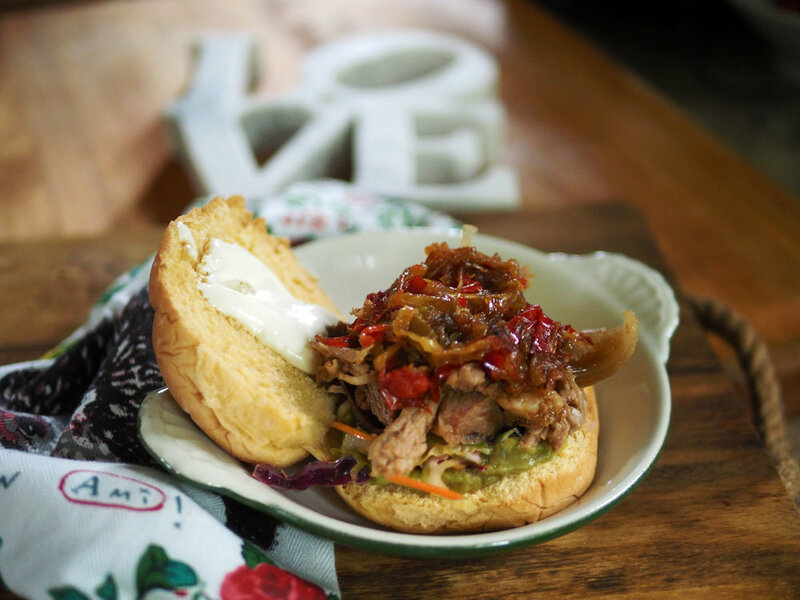 I used my Spicy Crunch Slaw recipe which I knew both the crunch and spice would work well with the pork. I bought guacamole because frankly I had way too many other things to make, and a good store bought one can be delicious. I made caramelized peppers and onions, and created my own type of ‘mayo’. I used half mayo, half greek yogurt with lemon juice to thin it a bit, salt and pepper, but you can use mayo if that’s your groove. Once I gathered all the ingredients, all that was left to do was to pile them onto a soft bun. Everyone was ready and waiting to be piled on. Start piling on the flavors. I think the slaw works nicely with the guacamole. Creamy and tangy mixture of mayo, yogurt, salt and pepper. Sautéed peppers & onions.Simply slice them thin and slowly sauté them in oil and butter until they are soft and caramelized. Salt/pepper, too. A platter full of pork with luscious juices and soft, flavorful onions. Funny enough, my original blog post suggested that this was a Super(bowl) of a sandwich and I posted right before SuperBowl Sunday thinking you might serve it for the big game. And now, I am posting my recreation again right before the SuperBowl. So, now you can serve up this ‘towering monument’ of pork to your cheering fans. 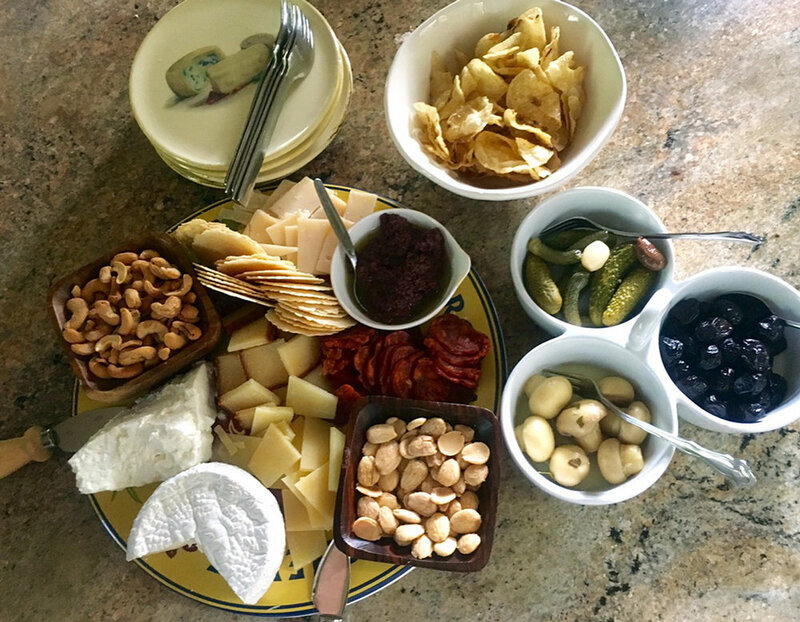 You may also want to include a charcuterie/cheese platter, as I did. A few other ideas for game day; maybe make my 3 Dips or my Tapenesto. Great choices for a crowd. No matter what you serve, you are a winner in my book. Always a seeker of how to take ordinary ingredients and serve them up differently, an idea caught my eye the other day while I was working a catering gig. The chef was serving up coconut shrimp, sort of standing up with the tail sticking out. Of course, he served them with their tail shells still on. Which made sense for his presentation, so people could grab and bite away. I’m not usually a fan of shell tails on. Two reasons, really. One is that people often just bite up to that point and leave that cute little shrimp meat inside the tail, missing out the tail section. Two, it’s an extra thing people have to deal with, and can be messy depending on the presentation. But for this application, tails on it is. Tails UP & OUT to be exact. So, borrowing from the ‘standing up shrimp’ idea I decided to create a shrimp roll of a different kind. I didn’t want something heavy, or that needed to be fried up or warmed up, making it more work for serving. I wanted something pretty, and pretty delicious. Using shrimp, avocado, daikon radish shoots and dab of wasabi sour cream, I wrapped everything up in a cucumber slice. Normally, we buy extra large, jumbo or Tiger Shrimp. But for this appetizer, using a smaller shrimp (medium 35 count) creates a one bite app that can be made ahead, kept chilled and served as guests first arrive. Since we are all super busy with just days before Christmas I’m not going to make you read a ton of my mind’s meanderings. We are just going to get down to it, so you can serve this up for Christmas eve or day of. Also, no amounts for this one. It will all depend on how many guests you are having. An English cucumber will yield about 20 long slices. A large Gwen avocado will give you plenty of slices, then some. * You can use any micro sprout you find. However, the daikon radish sprout has a spicy note to it, so if you use something milder, you might want to increase the amount of wasabi paste. Use your taste buds as your guide. It’s all about the green for this fresh bite. Using a vegetable peeler, slice the cucumber lengthwise. And set aside covered with wet paper towels. Wasabi comes in powder form or paste, and can be found in most grocery stores in the Japanese section. 3. To get the shrimp really flavorful, prep the poaching water by bringing to a boil 6 cups of water with 2-3 bay leaves, 1 T peppercorns, garlic cloves, parsley and salt. Then let simmer for 10 minutes to allow the aromatics to infuse into the water. The aromatics will lightly infuse flavor into the shrimp. 4. Meanwhile, get an ice bath ready (a large bowl of water with ice cubes with a smaller bowl inserted in the middle) to transfer cooked shrimp immediately after to stop the cooking. Nothing fancy, just a simple ice bath shocker to say ‘hey, no more cooking for you!’. 5. Once the water has simmered, squeeze the lemon into the water and toss it into the pot. Then add the shrimp and let cook for 2-3 minutes until they turn opaque pinkness orange. Transfer them immediately to the ice bath. 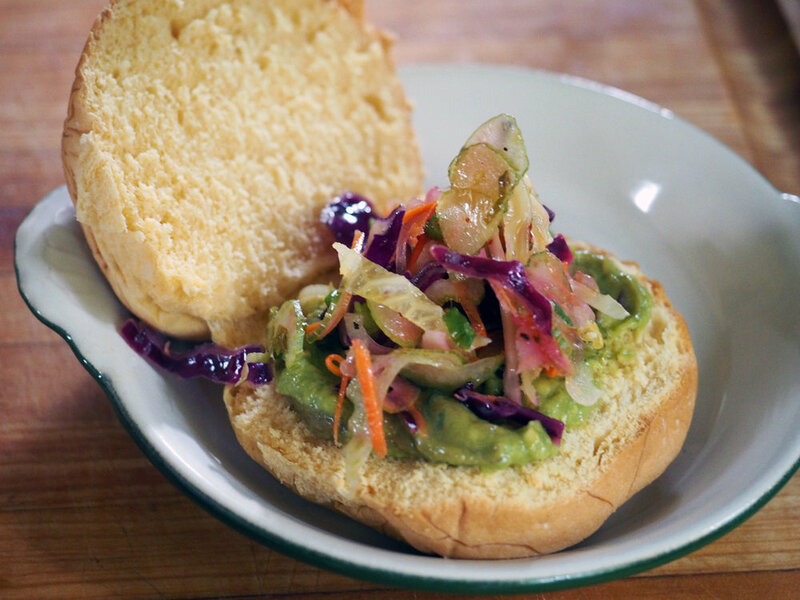 The avocado will add a creaminess to this bite. Mise en place. Get everything ready and in place. 7. Assemble by laying the cucumber strip down and placing shrimp, avocado and radish shoots on the end of the cucumber, and begin to roll. Since shrimp curl when they cook, I found that straightening the shrimp out a bit helped with rolling it up. 8. Once rolled up, squeeze or place a dollop of the wasabi sour cream on top. (I used a piping bag because I find it easier. You can use a plastic bag with the tip cut off, or simply dollop it on). Just a little squeeze of wasabi sour cream with brighten and bring heat at the same time. Place on a platter. Or maybe a tiered plate rack. Whatever floats your shrimp boat. This bite size appetizer is light and a refreshing twist on the high fat, high calorie fried shrimp roll. I adore how the sprouts stick up. It’s colorful. It’s playful. It’s just the right size bite. You get the idea. Mix up a bit whatever creamy option you like with something you love that pairs well with shrimp to make it tad more special. But wait, there’s more. Because I hate to waste, and I had cucumber left over, I cut it into thick slices and created a vegetarian option. All it took was some radish shoots, avocado slice and dollop of wasabi sour cream to create a bite for the non fish eating crowd. Another ‘leftover’ was the outer peel of the cucumber. I tied it into a knot and used it to decorate the plate. Two for one, all the way around. Extra cucumber, comes to the rescue of vegetarians! Pretty, green pop in your mouth freshness. Now that is a whole lot of LOVE going on. You might notice a new love sign. The large one was given to me by my sister, Jill. It brings me such joy that people notice a simple sign, and begin to spread the love. The whole idea is catching on. 2stirwithlove, everything you do. These make a great pass-around appetizers as well as one that looks great on a buffet. Have yourself a Merry Little Christmas and a Shrimp Cucumber Roll, with their tails sticking out! Post Note: I made these again but I forgot the avocado. So in true ‘use what you have’ mode, I swapped it out with mango slices. I have to say, I think I liked it even more! You know the old saying, “Soup Is Good Food”. I couldn’t agree more. It’s soothing. It’s filling. It warms your belly, and your soul. It cuddles you from the inside out. For me, it really doesn’t matter what time of year it is, I tend to always enjoy a bowl of soup. Naturally, soup fulfills its goals most definitely during the fall and winter months. Soups can run the gamut from super complicated and time consuming endeavors, all the way to ‘throw it all in a pot and cook’. From thin, clear broths to thick, chunky stew types. From vegetarian to hog filled meat pleasers. No matter what kind you are making, the key is flavor layering. Building up flavor profiles one by one gives depth and makes the soup richer. Even though I featured this soup with a simple ‘how to’ in my recent blog post Monday Night Dinner, some of you asked for more specifics. So if you ask, I want to deliver. Whatever I can do to make cooking easier, and a pleasure for you. JuanCarlos was the one who made this soup for our guests that evening. I have made versions of this by adding spinach and scallions. You will see that the add on possibilities are vast. Savoy cabbage would be great, or a scoop of rice. But I like to enjoy it like this, clean and pure to let the broth sing and the fish shine. So, here goes it. This recipe and the steps are so easy you won’t believe that it takes practically no time to cook. The determining factor is the kind of fish used and how they are cut. Shrimp, Calamari (Squid) and Monkfish all cook in the same time, and super fast. I mean, 5 minute FAST! I would venture to say if you had all your ingredients out and ready to cut, you could make this soup in 20 minutes start to finish. 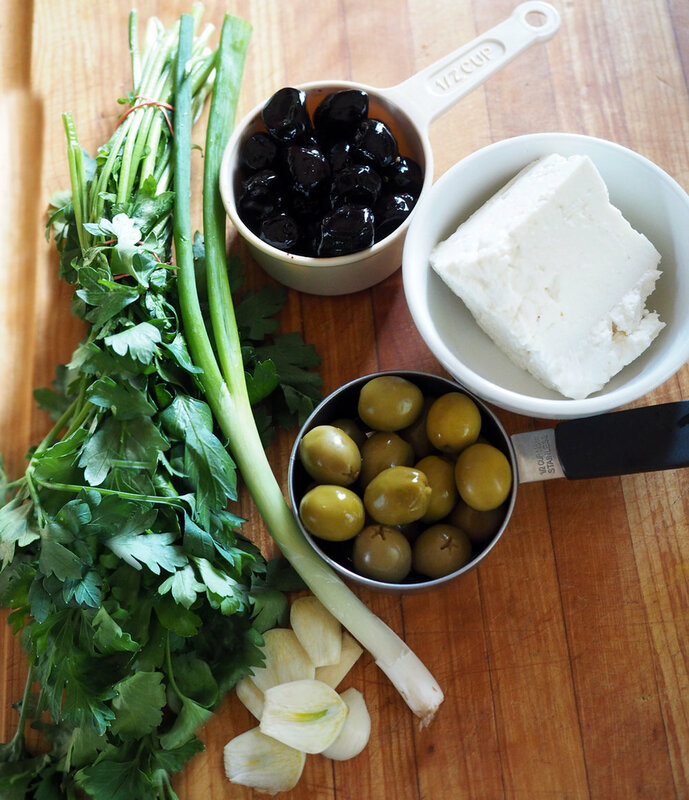 A few simple ingredients make a fish soup that will be remembered. cook over a medium low heat, softly sautéing them. Then add the parsley, and cook slowly. The aromatics. This is the beginning of flavor building. Build up the flavors and let the onions and garlic flavor the oil. Then add the parsley and let it do the same. 2. Meanwhile, clean and cut the fish into bite sized pieces. Monkfish comes in a long strip. I cut in down the middle, then cut small 1” cubes. For soups, I usually get a smaller shrimp and then still cut them in 1/3’s so they are small enough to fit on a spoon. No one should have to take the time to clean squid. Buy it cleaned. Just make sure the inner cartilage is removed. Then slice ringlets. All the fish is ready to go while the aromatics are cooking. beans and their liquid. Slowly warm through. taste for seasoning since water isn’t seasoned where I come from. Bring to a boil. 5. Lower heat to a simmer and add all the fish pieces. Cover and cook for 5-6 minutes until the fish is tender. DO NOT cook longer or the fish will get overdone and rubbery. Taste the calamari and make sure it’s cooked through. Also, taste for seasonings. Look at how beautifully cooked and tender each piece of fish is. A bowl of Good Food. All that is left is to serve it up immediately, garnish with more parsley and enjoy a warm bowl of clean broth with hearty protein. It will warm your soul, bring a smile to your face, and joy to your heart. Seriously, how much more can one ask from a soup?